All our laminated plywood trays are shatterproof and dishwasher safe. Handcrafted from Finnish birch wood in Finland. The poster was commissioned by the Finnish State Railways. Artist Osmo K. Oksanen asked his daughter to pose in front of the family house drive way. There she was given Ms Oksanen’s make-up bag to hold and suddenly a little boy with a suitcase was created. 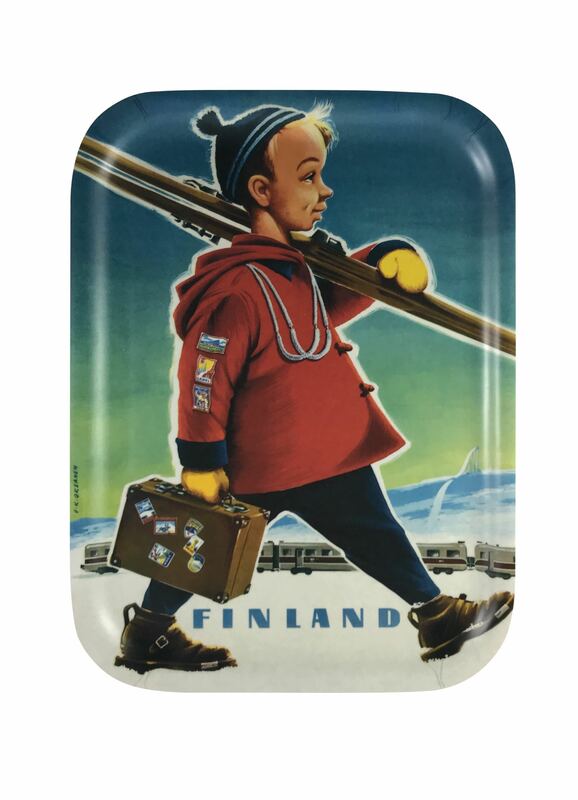 Note the labels on the suitcase: Inari, Kuopio, Ivalo and Pallastunturi – classic tourist destinations. Mr Oksanen is naturally one of our favourites. Why? Well, Oksanen’s sense of humor is in its own league. And hey, there is also a summer version of this poster. There the boy wears shorts and an umbrella has replaced the skis.